The photo above was posted publicly before November 19th and the person who published it said that the buck was rumored to be taken near the town of Frankvill in Winneshiek, County Iowa. Heartland Outdoors blogger, Tim Walmsley also shared that the buck was taken in Northeast Iowa. 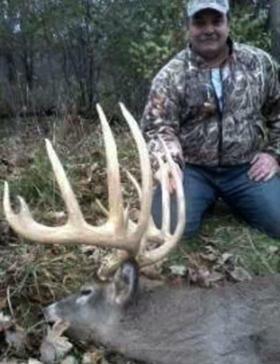 OutdoorLife reported that Scott Bestul of Field and Stream and Walmsley the buck measured a reported 206 inches. It’s unknown whether that is a gross or net score, but to unseat the current Pope and Young club typical archery record, the deer would have to score more than 204 4/8 inches. That buck, the current typical record, was taken in Peoria County, IL in 1965 by Mel Johnson. If you have any more information on this buck or would like to share your story or any user submission, please send them to PJ@morningmoss.com or hit us up on our Facebook page.